It was the time when Björn Borg rocked Wimbledon and the Australian Open, Abba and David Bowie sounded from the speakers, and you could still combine white tennis socks with sandals. 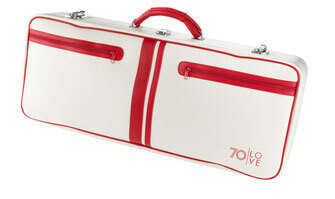 The tennis case! 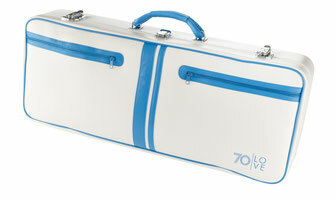 Though we prefer to call it the lifestyle case, because a lot of you are after the cool style of the 70's but wont to pack all kinds of things. This is why we have also gently modernised the case, for example because today's sneakers are higher cut than they were 40 years ago. Furthermore, you'll find plenty of pockets inside and out for laptop, smartphone, tablet, headphones and everything you need for work, university and leisure time. You'll find further information here. 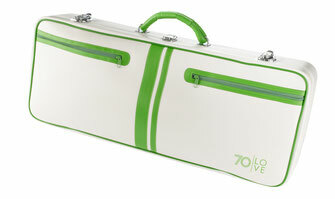 For an especially stylish appearance: this spacious and sturdy retro case made of easy-care PVC not only carries your most important utensils such as rackets, balls, shoes and refreshments for the tennis court, it's just as good for your weekend baggage - everything you need for a day at the beach, your skateboard, racing gear, football clothes and much more!